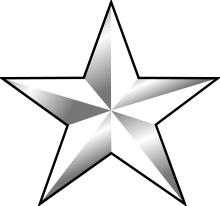 A four-star rank is the rank of any four-star officer described by the NATO OF-9 code. Four-star officers are often the most senior commanders in the armed services, having ranks such as (full) admiral, (full) general, or air chief marshal. This designation is also used by some armed forces that are not North Atlantic Treaty Organisation (NATO) members. The four-star rank is reserved in Brazil for the highest post in the military career. The officers in this position take part of the high command of their corporations. The commanders of army, navy and air force are also four-star generals, but they have precedence to all the others military in this rank. General/Admiral is the highest rank within the Canadian Armed Forces as defined within the National Defence Act. Usually, only one officer, the Chief of the Defence Staff, carries the rank of full admiral or general at any one time. However, the crown may authorize additional officers at that rank for special cases such as for Canadian officers in the position of Chairman of the NATO Military Committee, who are usually former Chiefs of the Defence Staff seconded to NATO for that duty. The Queen of Canada, Elizabeth II, is Commander-in-Chief of the Canadian Armed Forces. However, in line with the Letters Patent, 1947, the duties and title of commander-in-chief are normally exercised by the Governor General of Canada. The Minister of National Defence, since not a member of the Canadian forces nor within the military chain-of-command, has no rank. Prince Philip holds the four-star rank of admiral in the Royal Canadian Navy in an honorary capacity as of 2011. Before unification in 1968, the rank of air chief marshal (maréchal en chef de l'air) was the four-star equivalent for the Royal Canadian Air Force. Not to be confused with Generaloberst, the Wehrmacht equivalent until 1945, or Armeegeneral, the National People´s Army (East Germany) equivalent until 1990. While the general armii wore shoulder insignia with four small stars, the marshal and admiral flota wore one single large star on their shoulder boards, and the glavnii marshal the same large star with a laurel wreath, very similar to the modern army general insignia of the Russian Army. Upon their formation, the Russian armed forces discontinued the ranks of marshal and glavnii marshal. ↑ This rank insignia is not worn by all NATO officers. ↑ Canada - Department of Justice "Laws of Canada: National Defence Act, Schedule I"
↑ The Governor General, Commander-in-Chief ""